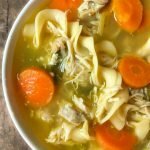 Chunky Chicken Soup in the Instant Pot - low carb version too! 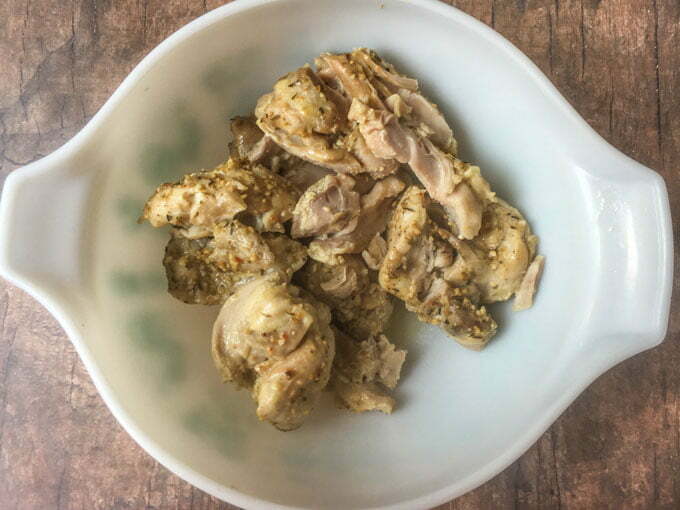 Chunky Chicken Soup in the Instant Pot – low carb version too! 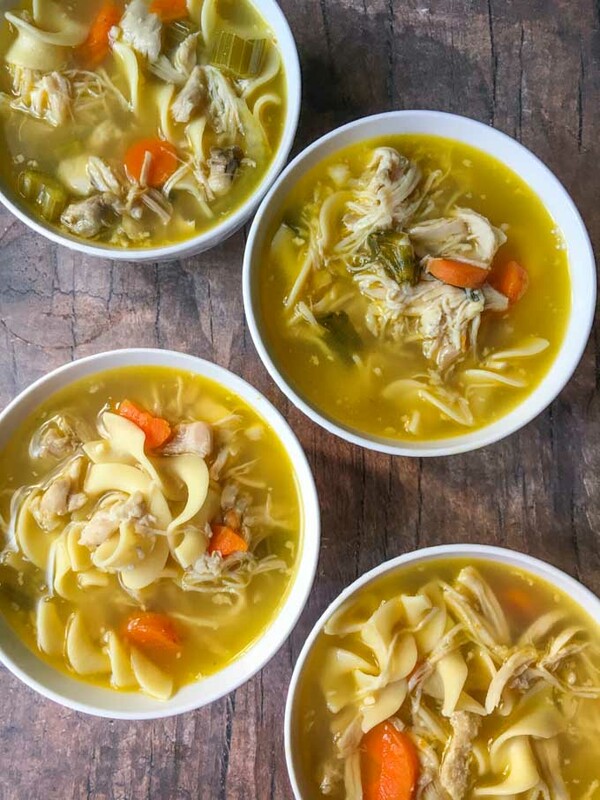 This chunky chicken soup in the Instant Pot is so full of flavor it is sure to be a family favorite. It’s easy to make a big batch and then freeze for cold winter days. You might also like this easy lentil and sausage soup in the Instant Pot recipe! I had not intended to make this recipe for the blog. 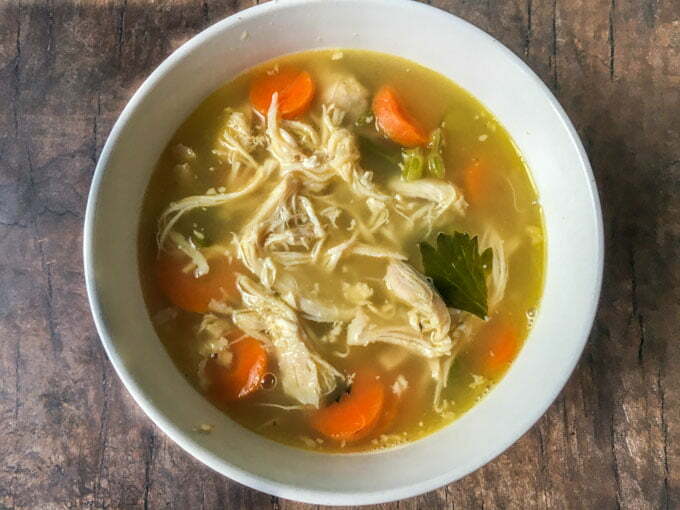 I actually had a lot of chicken thighs in the fridge and my hubby had a cold so I made this chunky chicken soup in the Instant Pot for those reasons. My family liked it so much I felt I should share it. While there are noodles in this recipe, you can just eliminate them and it would be low carb at only 2.9g net carbs. That is how I ate it and I’ll explain better below. Soup is a joy to make in the Instant Pot. For one thing, any meat you use will be very soft and tender. Also it’s a set and forget method for good soup fast. I love the slow cooker too but if you don’t remember to start your slow cooker in the morning you cannot be assured to get your dish by dinner time. With the Instant Pot can make just about any meal in a hour or two. You begin by adding some chicken broth in the Instant Pot. Then liberally season the chicken with salt and pepper and place in the pot. Close the lid and push the valve to the back. Hit the poultry button and this should be for about 15 minutes. When it’s done, do a quick release and take out the chicken. Shred it using two forks like I did below and set aside. Then add some carrots and celery, including the celery leaves. I added alot of garlic, grated ginger and a big tablespoon of Better than Bouillon. If you don’t have any you can use regular bouillon. Then add about 8 cups of chicken broth or water. Cover and manually cook for 5 minutes. If you are using noodles, add them at this time too. The key ingredient to all chicken soup or any soup in my opinion is Better than Bouillon. It gives so much flavor and it comes in a variety of flavors as well as low sodium or organic varieties. I have only used the beef and chicken flavors and LOVE them. You can buy them in the grocery store or on Amazon but I have even found it at Costco. When it’s done, add in the shredded chicken and give it a taste. It might need a little more salt and pepper. Or if you want more broth, you can add some in now and it won’t hurt anything. However this is a chunky chicken soup so there is alot of stuff in this one. If you are going low carb here is the soup above. It tastes great as is but you can add some meatballs or you can skip the pasta and add a beaten egg like in an egg drop soup. You just beat an egg and slowly pour into the simmering soup. Check out my low carb wedding soup to see how. Of course you can make this in the slow cooker too. I would add the all the ingredients except the chicken and noodles. Mix well and then lay the chicken on top. An hour before you finish, take out the chicken and shred it. Then mix it with the other ingredients. I would cook the noodles ahead of time and add it at the very end. This chunky chicken soup in the Instant Pot is so full of flavor it is sure to be a family favorite. It's easy to make a big batch and then freeze for cold winter days. Liberally season chicken thighs with salt and pepper. Add 1 cup of broth and chicken thighs to the Instant Pot. Add the lid and push the pressure release valve to the locked position. Press the poultry button and wait until the chicken is cooked. This was for 15 minutes on my machine. Quick release the pressure and take the chicken out of the pot. Place in a large bowl and shred. Using the liquid from the chicken, add the carrots, celery, garlic, ginger and Better than Bouillon. Mix well to combine. Add in the 7 cups of broth remaining and secure the lid back on the Instant Pot. If using noodles, add them now. If not, push the lever back to the locked position and manually cook for 5 minutes. 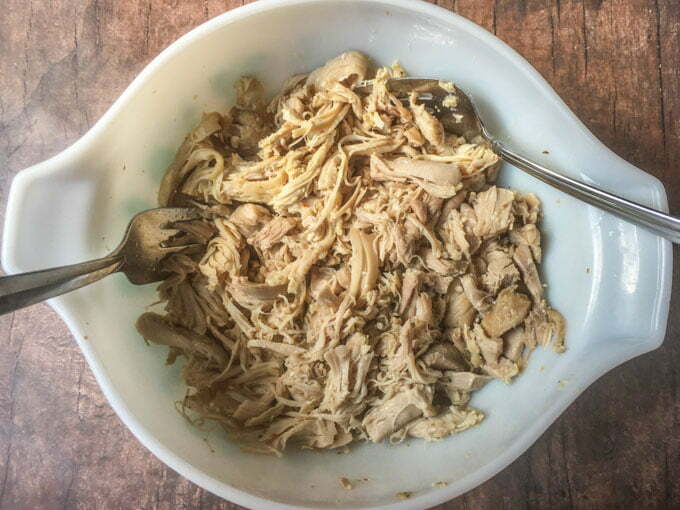 When the soup is cooked, add back the shredded chicken and let sit in the hot soup for a few minutes before serving. Taste to see if it needs more salt and pepper or even more Better than Bouillon. RECIPE NOTES: This should make a very large batch. You can add more broth if you don't want it as chunky. You can eliminate the noodles for a low carb version. You can freeze this recipe as well. 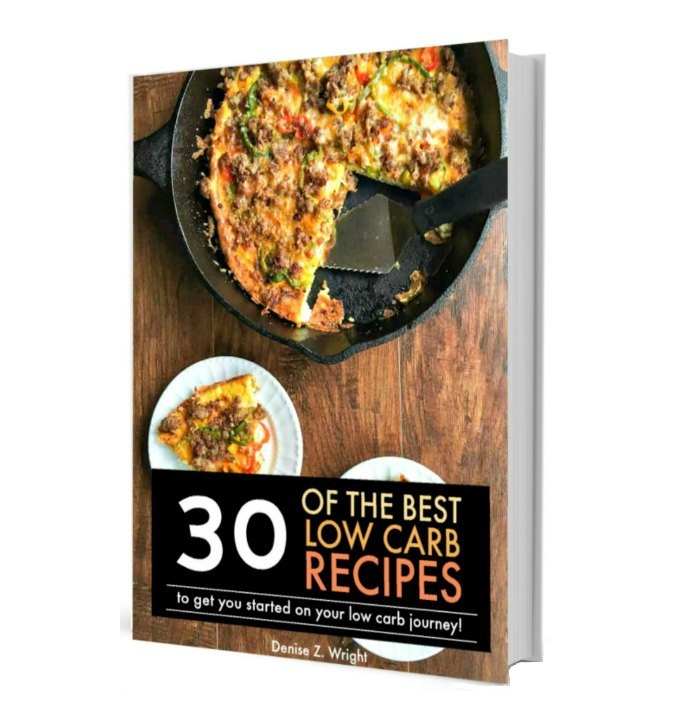 Previous Post: « Spaghetti Squash Low Carb Breakfast Casserole – for lunch or dinner too! So simple and yet so good! Thank you for this recipe. I would suggest low sodium chicken broth as the first batch I made was too salty for me. I also skipped the ginger as I don’t care for it. Great lunch for the week! 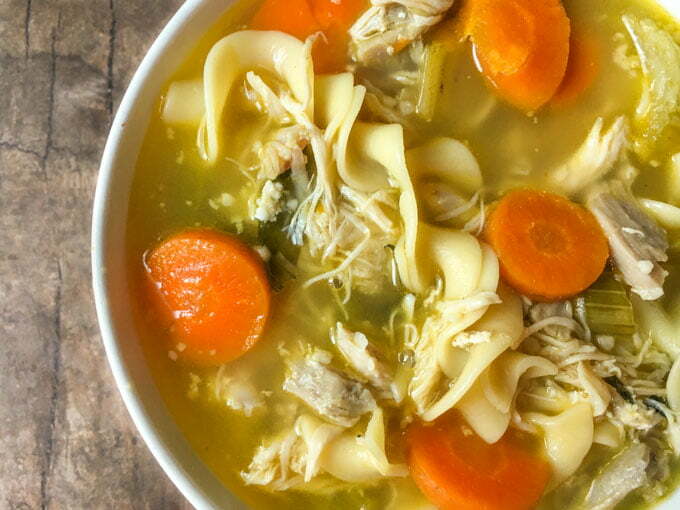 What a great looking soup — rich with chicken and flavor. This type of soup is what every mother and grandmother has in their bag of instant cures for whatever ails you. I love chicken soup and I never tire of it. I wish I had one of your bowls filled with that wonderful soup. I’m glad you decided to share this. It looks delicious. 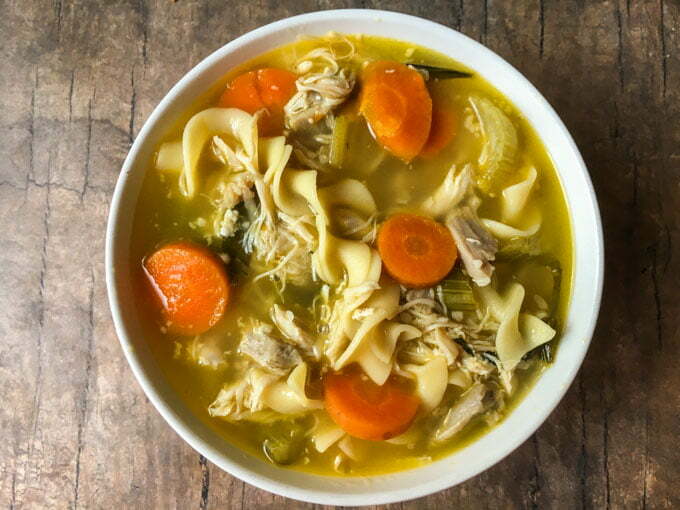 Hard to beat chicken soup on a cold chilly day, like the ones we’ve been having lately. Hope your hubby feels better! Thanks Jolina, we have been making this weekly and all sniffles are gone so I think it helped! I love chunky soups very much. It’s like a meal on it’s own. I’m so anxiously waiting for my instant pot. I have so many things to try. This really looks perfect for winter. 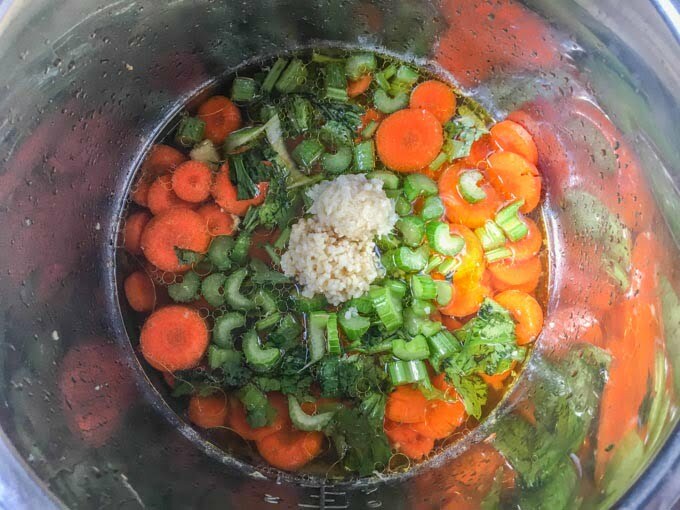 You will love your instant pot! This looks great and perfect for the coming colder weather. It really is a hearty meal in a bowl Patti! Denise makes everything well, but soups are a specialty. She made this because I was fighting a cold. Cold is gone so not only is the soup tasty, it cures colds. If only it did! I would make a million!